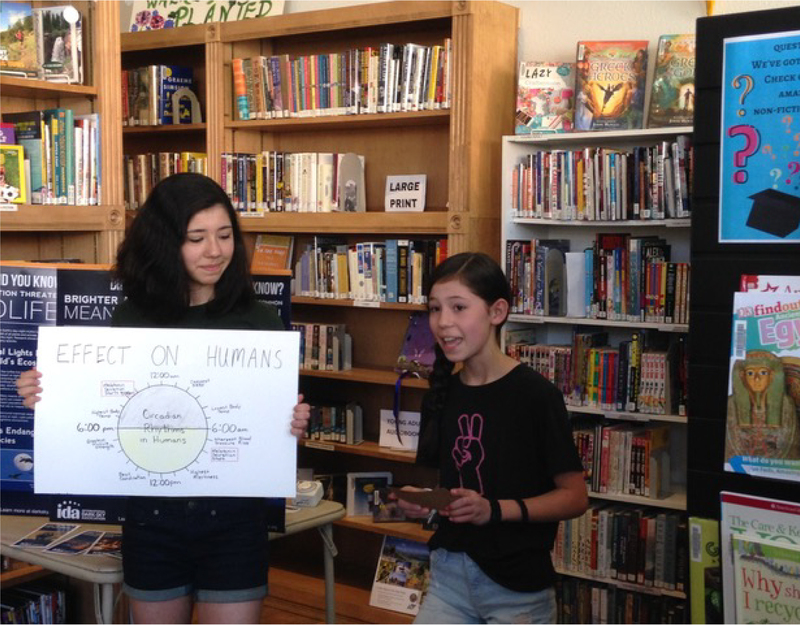 Sedona Parsons and Sophia Stone, from the Roarie Bummlers, present about the impacts of light pollution at their local library. 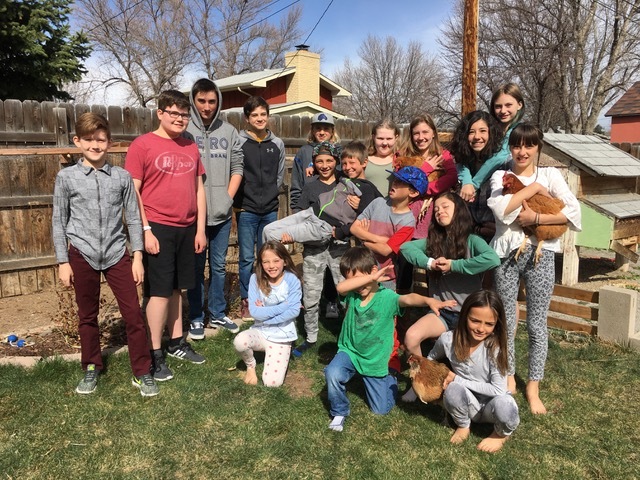 Calling themselves “The Roarie Bummlers,” a group of homeschoolers in Boulder County, Colorado, are researching light pollution and sharing what they learn with their community. The kids took the lead on the project and are doing it on their own, with a little help from their parents. One of the moms involved in the group, Pam Stone, says that the kids in the group range in age from 9 to 15. There are 17 kids in The Roarie Bummlers, whose name is a Scottish term meaning vast, moving storm cloud. Their project focused on Lyons, Colorado, a small town at foothills of Rocky Mountains. Using Sky Quality Meters loaned to them from Boulder County, members of the group measured light in several locations in the town during a new moon in February. The students focused on residential lighting and were surprised to find that the parking lot of a local park — Bohn Park — registered off the charts and was the brightest spot in town. Through the project, the homeschoolers are learning about dark skies, scientific research, and they are developing presentation and public relations skills. The students are writing articles for local publications, posting information about their study and about light pollution on social media, and have created posters and given a presentation at their public library — everything they can think of to get the word out about their project. Through their research, they connected with the IDA International Headquarters. As a result of their efforts to increase awareness of light pollution, they have created enough interest and support to consider establishing a new IDA chapter in the area. Concerned about the brightness of Bohn Park, some residents of the community have asked the students to present their research to the staff at the Department of Parks and Recreation. According to Stone, “the project took on a life of its own and started growing.” It really struck a chord and has been well received. In fact, residents of nearby communities started asking the students to come do measurements for them. Once there are more adults involved and a local IDA chapter is established, Stone hopes that the group will be able to provide this service. But for now, the local library has agreed to buy a dark sky meter to allow residents to take measurements themselves. Since their first set of measurements in February, The Roarie Bummlers have noticed that more people seem to be dimming or turning their lights off at night. But like any reputable researchers, they will be collecting more data before they come to any conclusions. They will be taking measurements in the same locations again, during a new moon in April, and comparing the data to their information from observations in February. True to their name, these kids are fast moving and bringing a change, and they hope to see a decrease in light pollution as proof that their educational campaign is having an effect already. Next post: Can Salmon Help Save the Night Sky?